Through their first three meets, the Panthers sat at 0-3 with losses to Hingham (87-17), Duxbury (54-46) and Plymouth North (67-33). After a rocky start, the Whitman-Hanson Regional High girls’ indoor track team regained its footing to finish the season strong. Reinforcements would be on their way, however, and in the Panthers’ fourth meet of the season Jan. 24, they scored a nail-biting 51-49 victory over Silver Lake. Trailing by three with one event to go – the 4×400 relay – the Panthers’ crew stepped to the line. Coincidentally, W-H was missing three of its four runners who had competed on the team all season long, leaving junior Dorothy DiMascio-Donohue as the only one who had previously done the event. So, the Panthers went with a next man up approach, inserting senior Julia Cosgrave and sophomores Victoria Boss and Courtney Woodward into the lineup. The tandem finished the course in 4:39.56, besting Silver Lake by nearly 13 ticks to lift the Panthers to victory. The girls then carried that momentum into the final meet of the season, two weeks later, tying Pembroke, 49-49, to cap off the winter at 1-3-1. 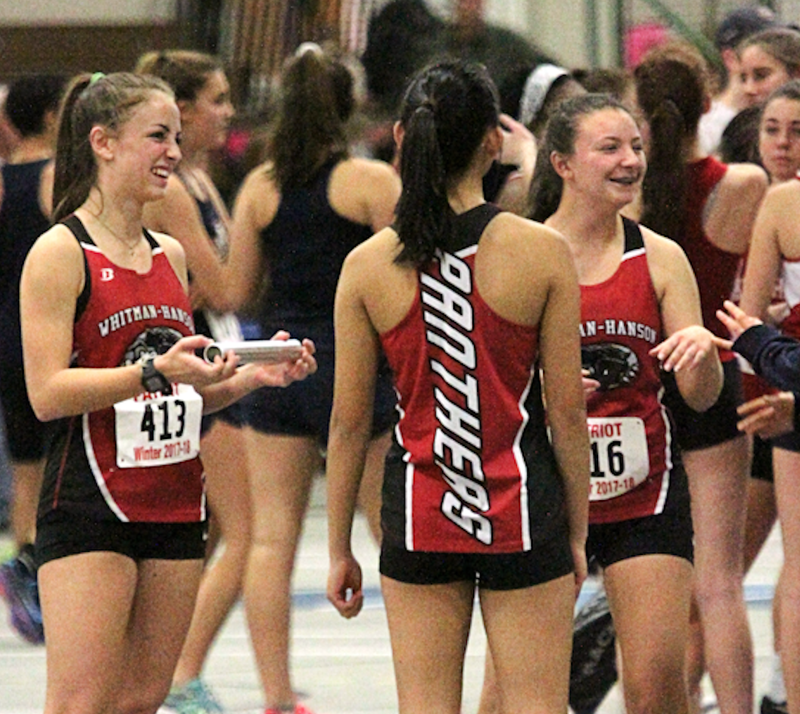 The Panthers were led by first-place finishes from DiMascio-Donohue (55-meter hurdles, 10.17), junior Allison Bartlett (long jump, 15-foot-2), junior Maeve McDonough (2-mile run, 13:16.77), freshman Isabelle Amado (600-meter dash, 1:52.16) and senior captain Nicole Norve (1-mile run, 5:26.63). It was one of many top-place finishes for the Adams State-bound Norve, who was tabbed as the team’s lone Patriot League All-Star. Norve also represented the Panthers in the Division 3 All-State meet, where she placed 10th in the 1,000-meter run (3:09.28) and 12th in the 1-mile run (5:26.81). Norve was one of a few runners who impressed George this season. George added he was pleasantly surprised with a handful of freshmen who burst onto the scene this season as well. “Isabelle Amado, Hailey Minicucci, Alaina Mutascio and Emma Rogers all showed some real ability in multiple events and should make an impact over the next three years,” George said. Next up for many the girls is the spring campaign. “Many of our kids run all year long and our between-season goal is just to get them rested so they can be healthy going into the outdoor season,” George said. Head coach Steve George said the strength of his team, which is coming off a 2-3 season in 2016-17, lies it its potential and the abilities of its untested newcomers. The Whitman-Hanson Regional High girls’ indoor track team is ready to hit the ground running, and fourth-year head coach Steve George remains focused on growth. “While victories would be outstanding for us all, we really focus on improvement, getting all our kids to achieve their personal goals and maximize that potential we see,” George said. George said the strength of his team, which is coming off a 2-3 season in 2016-17, lies it its potential and the abilities of its untested newcomers. A few of those newcomers George is referring to are freshmen Emma Rogers and Isabelle Amado, both of whom have caught his eye. “They have the perfect combination of having the ability to compete in multiple events and the willingness to take on the task of [multiple events],” he said. While there is an influx of young talent, the Panthers are still going to rely heavily on their veterans – spearheaded by senior captains Camryn Boyce, Lillian Perkins-Reisdorf and Nicole Norve. With that trio, along with the likes of juniors Dorothy DiMascio-Donohue and Allison Bartlett and sophomore Samantha Perkins near the top of the roster, George said he feels his club will be relatively strong in mid-distance and sprints/hurdles events. However, George noted while his team has the potential to yield a formidable 4×200 relay team, he would like to see an improved performance in that event from last season, along with the shot put. That will come with time as the team finds a way to replace multi-event school record holder Alex Santos, along with Lily Nolan, Olivia Morse and Olivia Reed. “I’m confident we’ll get there with the young talent on the team, but we may need to tough it out in a couple of meets first,” George said. The girls will be back in action on Tuesday, Dec. 19 at 4:30 p.m. at the Reggie Lewis Track and Athletic Center in Roxbury against Duxbury. Samantha Colleti will run at Army West Point next season. The Whitman-Hanson Regional High senior is a heralded runner. One local Hanson resident is taking her talents to the collegiate level by a different route. Samantha Coletti has officially received her appointment from the United States Military Academy at West Point, N.Y.
Coletti, a senior at Whitman-Hanson Regional High, first showed interest in attending the United States Military Academy before the school year began. 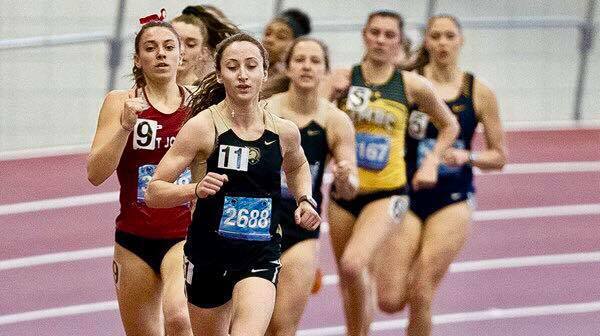 Coletti reached out to the track coach about it via email over the summer, and said she was thrilled when she heard the news that she was accepted. “I remember running downstairs in excitement after getting a call from [the track coach] a few days later,” Coletti said. W-H girls’ indoor trach head coach, Steve George, said Coletti is the type of athlete coaches dream of having. Coletti said she has been running for about nine years, with four at the high school level. Her list of achievements while running for Whitman-Hanson Regional High Schoolis immense. George said Coletti’s success stems from her passion and dedication to running. Coletti said she has gained a wealth of knowledge over her time in high school. Coletti is a year-round competitor. She ran cross country in the fall, is running indoor track this winter and will run outdoor track in the spring. As for the next level, Coletti said she is most excited to be a part of the traditions at West Point and to build strong relationships with her fellow cadets and eventually become a leader in the Army. When Coletti isn’t running, she said she has an interest in art and an eagerness to spend time with friends andfamily. There is one more message that she would like to convey to everyone who made this opportunity come true. There is one more message that she would like to convey to everyone who made this opportunity come true.